#Skibar! 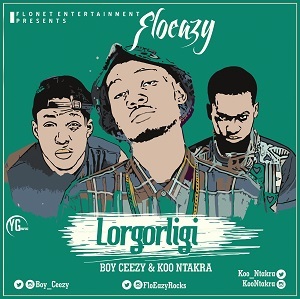 ​FloNet Entertainment presents FloEazy with a 9Ja/Ghana collaboration titled LORGORLIGI on which he features two of Ghana's Hip-Hop Heads, Koo Ntakra a KN Records signed act who won the 2nd season of MTN Hitmaker, and Boy Ceezy of LowKey Gang. LORGORLIGI is a Hip-Hop / Dance-Hall Number you would love to select any day. The DJs would love to start a party with this and OAP will also love this Radio friendly Joint Produced by Skillis Beatz.